Hi, I’m Jenn, and it’s been over two months since I last posted. During that time, I have started working on some group projects, as well as continuing my own. However, I decided to make this post about traditional artists that influence me. It’s important to identify the artists and types of work you like, so that you can understand your own artistic sensibility. I don’t necessarily do the same type of art as them; yet, I admire what they do, and their work inspires my own. 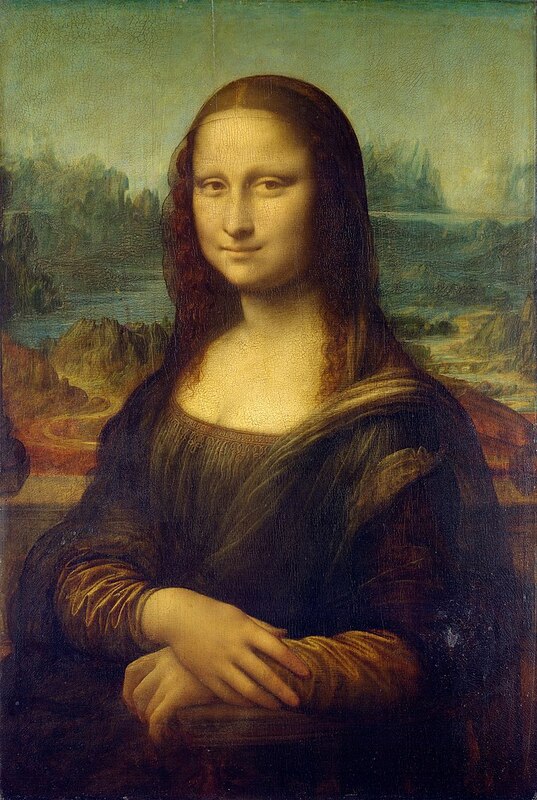 Leonardo da Vinci (1452 – 1519), one of the great (ART with a capital A) artists, is very well-known for many reasons. He was an inventor, sculptor, painter, engineer, mathematician, architect, writer, musician, geologist, botanist, anatomist . . pretty much THE Renaissance man. He painted the Mona Lisa and the Last Supper. Although his paintings are extremely well-known, I tend to gravitate more towards his drawings and sketches. I especially love his drawings of anatomy. Sure, he dissected corpses (illegally) in order to capture the science behind them. But, he drew them with exquisite detail from life (or death). Plus, there’s something about the dirtiness of a sketch, with all its markings and lines present for the eye to see. Sketches have a sense of life about them. Maybe that’s why animators often tend to draw out their characters’ movements and leave the lines and motion paths untouched. Da Vinci’s work is one of my reasons for taking up drawing anatomy. Also, it’s important to know how to draw a human figure before you start to minimize that form into a more stylized character. One of my favorite works of his is the Vitruvian Man. The next artist, Katsushika Hokusai (1760 – 1849), was a well-known Japanese ukiyo-e painter and printmaker during the Edo Period and Japan’s leading expert on Chinese painting during his time. He is best-known as the author of the woodblock series “Thirty-Six Views of Mt Fuji“, which includes the iconic Great Wave off Kanagawa (also known as Under the Wave off Kanagawa). Although the use of multiple names was a common practice of Japanese artists of the time, the numbers of names he used far exceeds that of any other major Japanese artist. 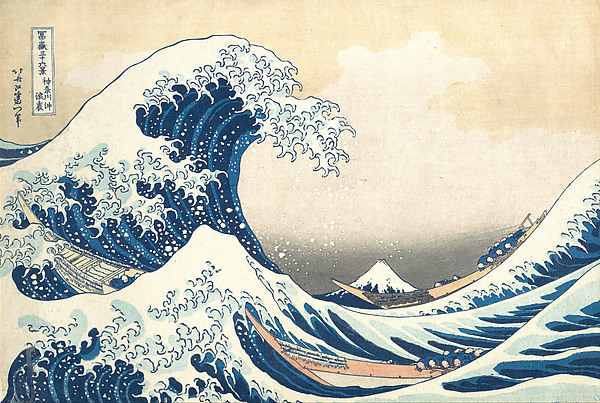 Hokusai’s name changes are so frequent, and so often related to changes in his artistic production and style, that they are useful for breaking his life up into periods. Ukiyo-e traditionally was a medium for portraiture, focusing on images of Kabuki actors and courtesans. While in the Katsukawa school learning this art form, Hokusai began exploring other styles, including European trends he was exposed to through Dutch and French copper engravings. He was soon expelled from that school, but this inspired him to create his own artistic style. Hokusai changed the subjects of his work, moving away from the images of popular people, and focusing on landscapes and the daily life of Japanese people from various social levels. Over the years, he became famous both for his artwork and his talent for self-promotion. His works also include Hokusai Manga and various etehons, or art manuals, which featured quick lessons in simplified drawing, often with humorous overtones. Hokusai’s manga, sketches, and caricatures, that included thousands of drawings of animals, religious figures, and everyday people, were very popular, and have influenced the modern form of comics known by the same name. 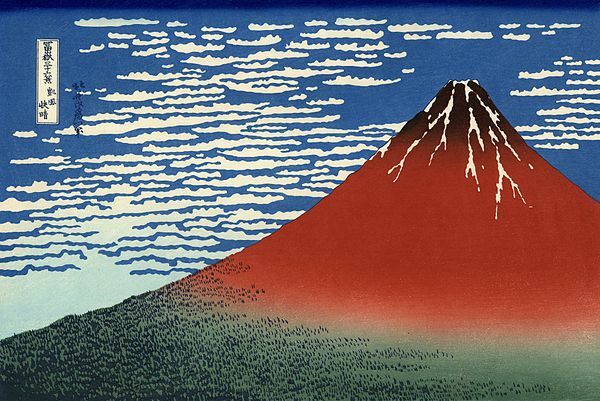 Most of his well-known work was produced in his late life, including the series “Thirty-Six Views of Mt Fuji” and “One Hundred Views of Mt Fuji“, which is considered the masterpiece among his landscape books. Hokusai believed that as he grew older he would begin to grasp the essential nature of his subjects, eventually gaining a divine understanding of them. Constantly wanting to produce better work, he continued to wish for another five or ten years of life while on his deathbed. Nevertheless, his work reached the Western art world, creating Japonism, influencing such artists as Van Gogh, Monet, and Gauguin, and transforming Impressionism. Another of my artists is one of the world’s most famous graphic designers, M.C. Escher (1898 – 1972). During his lifetime, he made 448 lithographs, woodcuts and wood engravings and over 2000 drawings and sketches. The themes of his work are mathematical calculations, impossible constructions, symmetrical images, and transformations. He played with forced perspective in a very three-dimensional way, and he gave Oscar Reutersvärd‘s shapes and objects (that eclipsed geometric laws) a place in his etches, drawings, and paintings, incorporating them into impossible worlds that transcend the Euclidean laws. He inspired other artists and mathematicians to create impossible shapes, and to this day, others are influenced by his work. His constructions are frequently used in stereoscopic examples, and they have also influenced games. The most recent are Monument Valley and Relativity (which is to come out soon this year). Both of these are 2D games, as it is easier to simulate Escher’s world when there is a forced perspective (as in two-dimensional space). 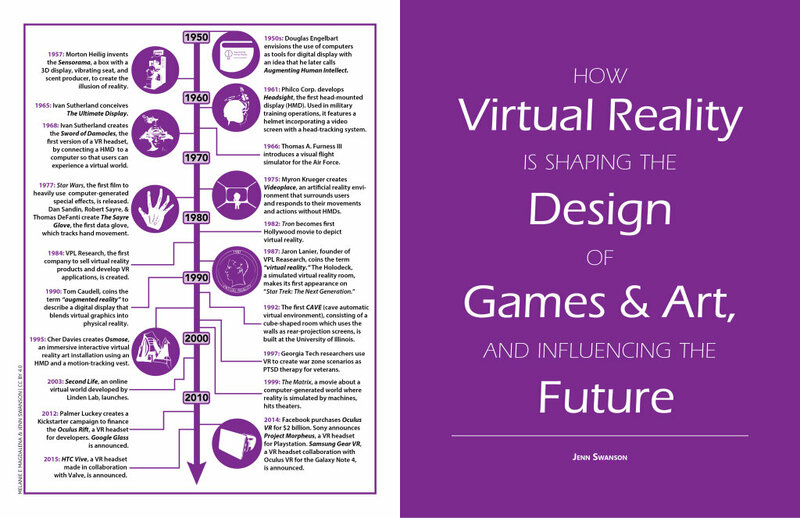 However, as talked about in this article, it is impossible for his objects to exist in a 3D environment, for they are impossible constructions not meant to exist in our world, much less in virtual reality. This is not to say there might not be any 3D Escher-inspired games in the future. It seems that as technology develops, so too does our willingness to make the impossible possible. My favorite thing about Escher’s drawings is that they cause us to wonder and challenge the very laws of reality. The last of my “traditional” artists is Salvador Dali (1904 – 1989), who would probably not have liked being called traditional at all. As a Surrealist icon, he was known for his skills as a painter and the shocking quality of his imagination. 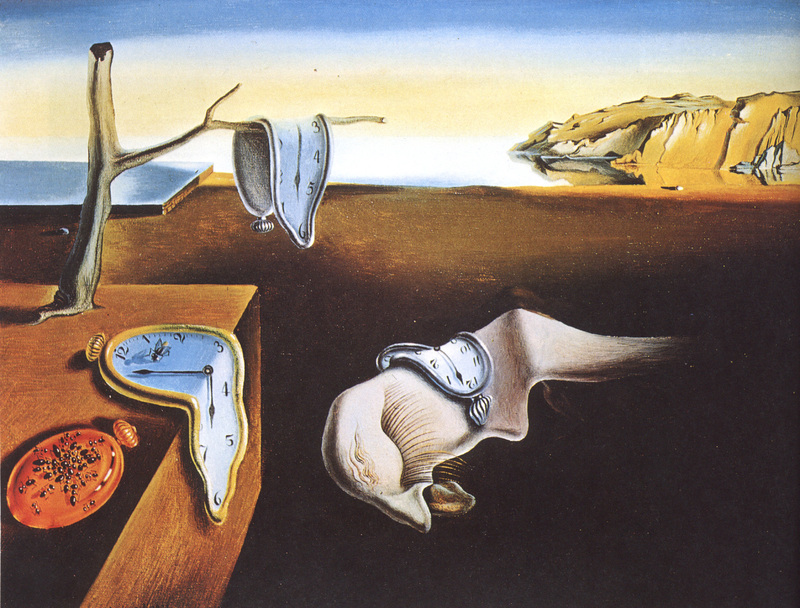 He referred to his paintings as “hand painted dream photographs”, and his most well-known work is The Persistence of Memory. Mastering what he called “the usual paralyzing tricks of eye-fooling,” Dali painted this work with “the most imperialist fury of precision,” but only, he said, “to systematize confusion and thus to help discredit completely the world of reality.” This philosophy went well with the Surrealist ideology to release the creative potential of the unconcious mind, through such things as the irrational juxtaposition of figures. 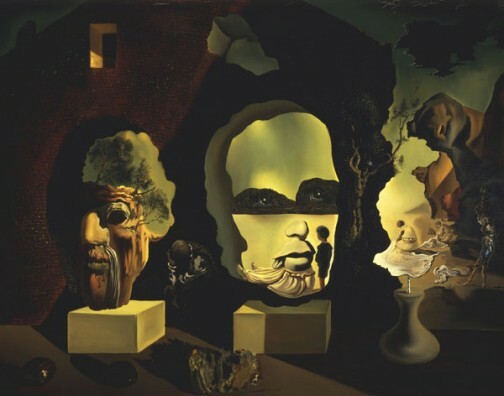 Dali also invented double images through a process he called the paranoiac critical method, in which he would stand on his head to induce hallucinations as inspiration. This resulted in the willful distortion of reality until one could see wild visions jumping out of ordinary objects. Some examples of these paranoiac critical paintings are Swans Reflecting Elephants and Old Age, Adolescence, and Infancy (as shown below). Although Dali was expelled from the Surrealist group during the mid-1930s, he continued to participate in international Surrealist exhibitions, and his work persisted to show a Surrealist influence. Over the course of his life, he also worked outside of painting, writing Un Chien Andalou with Luis Bunuel, working with Alfred Hitchcock on Spellbound, and creating the animated short film Destino with Walt Disney (which only recently was completed in 2003). During his life, two museums dedicated to his work were built – the Teatro-Museo Dali in Figueres, Spain (his birthplace) and the Dali Museum in St Petersburg, Florida. Dali was one of the first artists that came to realize that public relations was more important than talent; however, he possessed great talent. During his training as an artist, he studied the masters, and it was his belief that only once one has perfected the technique of the masters, can they create their own style. Dali used PR to focus attention on his work, doing commercials and performance art, as well as working with other artists on collaborations. It worked. Everything that he made sold. Dali had vowed never to be forgotten, and with his creation of the Teatro-Museo Dali, he achieved immortality. All of these artists were game-changers in the world of art. They broke the confines of the normal and enhanced the imagination, often inspiring other artists along the way. I’m not sure how the world would be without Da Vinci’s anatomic drawings, Hokusai’s ukiyo-e prints, Escher’s impossible etchings, or Dali’s surrealist paintings, but I believe that it would be much less interesting than it is now. This is only my short list for traditional artists, not even including architects. There are many more that have changed the way the world views art. However, these are the four that I look to whenever I reflect on traditional 2D artistic influences.